Send your cost estimates to your clients easily, or use their Excel sheets to import them elsewhere. 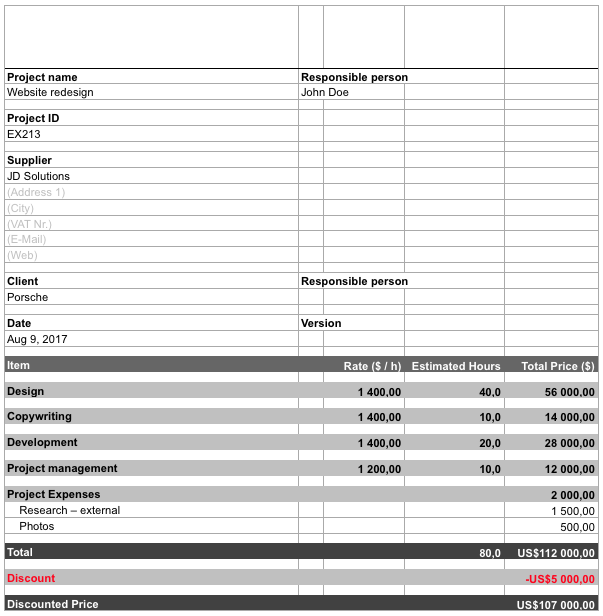 All project cost estimates can be created in Costlocker and then exported into Excel to be sent to the client. You’ll save lots of time by exporting from Costlocker, as opposed to creating calculations in Excel and entering them into Costlocker once they’re approved. Costlocker doesn’t make mistakes. When working in Excel, there’s always a chance that human error may lead to wrong calculations – and invoices. Go to the project page and click the Cost estimate tab. Then, click Export to Excel on the bottom of the screen – an .xls file will be downloaded.